Haryana Staff Selection Commission (HSSC) was issuing fresh job recruitment notice for the recruitment of Assistants, Officers & Supervisor post open recruitment notification. This is SSC Recruitment of 2017 offers job opportunity are now fully open for the post of Assistant, Officer's and supervisor apply fast for selection in Haryana Staff Selection Commission (HSSC). Who Can Apply? Those applicants who just completed their 10th, 12th Diploma, B.Sc, M.Sc, MA can apply for this latest recruitment notification published by SSC Recruitment 2017. They are planned to recruit total no. of candidates for Assistants, Officers & Supervisor Vacancies are 950 posts to fill up. Staff Selection Commission already open to receive the job application forms from every individual applicant. Eligibility Requirement: All eligible candidates have to apply offline for this job vacancy of Assistants, Officers & Supervisor Vacancies in SSC Recruitment 2017 on or before 04/08/2017. Find all the below require information about this vacancy such as age limit requirement, Selection Process, Qualification limit, Application fees, How to apply and more other essential details for this post. Be sure before submitting any application, check your eligibility matches and other details to apply for this job. 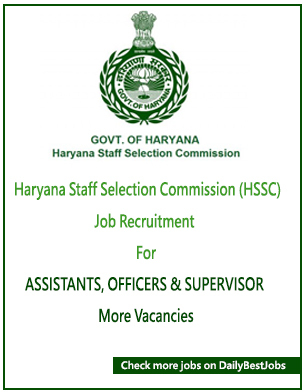 Address for this job vacancy: Haryana Staff Selection Commission (HSSC), Gurgaon. Staff Selection Commission SSC Recruitment 2017 are going to recruit for the multiple vacancies such as Fisheries officers, Fisheries Supervisor, Assistant Fisheries Officer, Draftsman, Fisheries Extension Assistant, Farm Assistant, Head Statistical Assistant. Entirely aforesaid position requires qualification equivalent and good salary pay as per experience. (i) The candidates who willing to apply on or before 04/08/2017. (ii) There is no more any further detail information about the final selection process found in the official job recruitment notification. (iii) Haryana Staff Selection Commission will verify each job applications form from all the applicant as per official communication and invited for the written examination as soon as possible inform to candidates while showing huge interest in Govt job of Haryana SSC Recruitment of 2017. You have to check all info related to exam syllabus, paper pattern, admit card availability at the official website of Haryana SSC. Also, you need to verify your admit card confirm to attend the SSC examination, we will update this section when we receive more details of it. How to Apply at SSC Recruitment of 2017? The recruitment department of Haryana Staff Selection Commission has requested to apply and provide job applications. So, all the eligible candidates have to visit their official commission website i.e. www.hssc.gov.in under this click on jobs/career section to submit your online application before 04/08/2017. All applicants must remember this important last date to apply for this Assistants, Officers & Supervisor Vacancies ends on 04/08/2017. Apply to SSC Recruitment of 2017 before last date ends. You will get more daily best jobs here, you have to just Subscribe below for free job alert, we will mail you all job updates or visit our website on daily basis for further job vacancies and job recruitment updates. We wish you all the best for this job by Staff Selection Commission Recruitment 2017 and submit your application for prior selection.